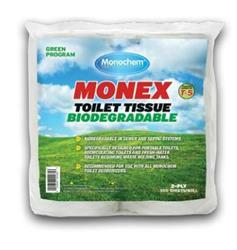 Enjoy the comfort you get from this premium 2 ply tissue with 500 sheets per roll. This virgin blend provides maximum absorbency and the quilted layers insure the ideal balance of strength and softness for a superior clean. In addition to these comfort features, Monex is designed to break down quickly in the holding tank preventing clogs from forming in the filters or valves. Perfect for use in RV’s, Motor Coaches and anywhere else limited water flushing is the challenge.